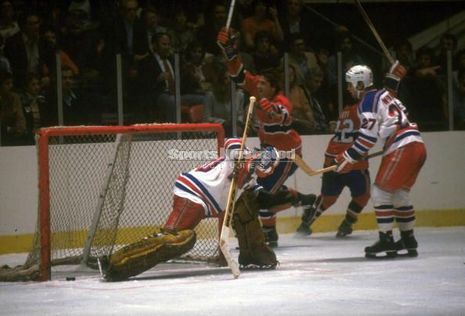 The 1979 Stanley Cup Final NHL championship series was contested by the New York Rangers and the defending champion Montreal Canadiens, making their fourth straight appearance. It was New York's first appearance since 1972. The Canadiens would win the best-of-seven series four games to one, to win their fourth consecutive Stanley Cup. As of 2009, this is the most recent time that two teams of the Original Six have competed for the Stanley Cup championship. Montreal defeated the Toronto Maple Leafs 4–0 and the Boston Bruins 4–3 to advance to the finals. New York defeated the Los Angeles Kings 2–0, the Philadelphia Flyers 4–1 and the New York Islanders 4–2 to make it to the finals. The Canadiens won the Cup in five games, winning it on home ice for the first time since 1968. After the game Jacques Lemaire, Yvan Cournoyer and Ken Dryden retired. Coach Scotty Bowman would leave the Canadiens to join the Buffalo Sabres. Yet another Montreal Canadiens dynasty was capped off with this, their fourth straight Stanley Cup victory. What was more remarkable, perhaps, was that this was the second time Montreal had won four straight dating back to 1960 when they won five straight. This was the Canadiens' sixth cup of the decade. Bob Gainey won the Conn Smythe Trophy, scoring 16 points in 6 games. Ken Dryden, Yvan Cournoyer, and Jaques Lemaire retired after the season, having combined for an amazing 24 Cup rings. This would also be coach Scotty Bowman's last year behind the Canadiens bench having coached his fifth Stanley Cup title. The path to the 1979 Stanley Cup started smoothly enough with a four-game sweep of the Maple Leafs, the second straight season that the Habs ended Toronto’s season. Hometown fans went home happy after every game of the semifinal series between Montreal and Boston. The Canadiens captured the opening games at the Forum, 4-2 and 5-2. Boston Garden fans watched their Bruins pull even with a pair of one-goal victories, the second ending when Jean Ratelle broke a 3-3 tie nine minutes into the extra frame. Continuing to trade wins, Montreal took the fifth game 5-1 and then dropped a 5-2 decision to bring the series back home for a deciding game, the first time in four years that a Habs team faced elimination in the postseason. Leading 4-3 with just minutes remaining in the game, Boston took a penalty for having too many men on the ice. Guy Lafleur converted a Jacques Lemaire pass, netting the tying goal with just over a minute to go in regulation. 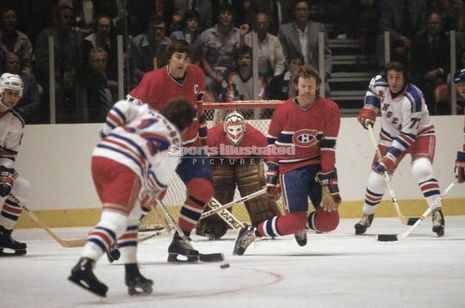 Nine minutes into overtime, Yvon Lambert buried a pass from Mario Tremblay behind Gilles Gilbert, the most important of his 27 career playoff goals to put the Canadiens back on the road to their sixth Stanley Cup of the 1970s. The Rangers, who disposed of the Islanders in their semifinal, took the opening game of the Finals. The 4-1 decision in front of the Forum faithful would be their only victory as Montreal rolled on to a 22nd Stanley Cup, with Jacques Lemaire netting the deciding goal in the fifth game. Bob Gainey, with 16 points in the run for a fourth straight championship, was awarded the Conn Smythe trophy as playoff MVP. 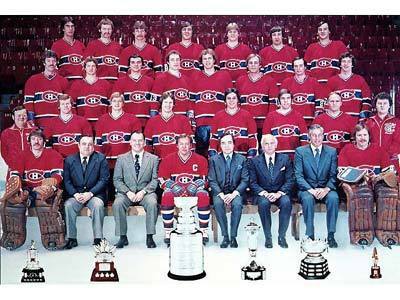 The 1979 Stanley Cup marked the end of an era in Montreal, with veterans Lemaire, Dryden and Cournoyer all announcing their retirements and coach Scotty Bowman leaving the organization by the time training camp opened the following fall.